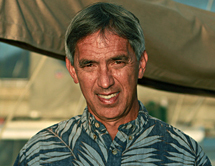 Charles Nainoa Thompson is a native Hawaiian navigator and the president of the Polynesian Voyaging Society. He is best known as the first Hawaiian in seven centuries to practice the ancient Polynesian art of long-distance navigation known as “wayfinding”, a practice which relies on navigational clues using the sun and stars, winds and clouds, seas and swells, and birds and fish—but no western instruments. Nainoa’s successful launch and navigation of Hōkūleʻa, a traditional double-hulled voyaging canoe to Tahiti in1976, proved the efficacy of this non-instrument navigational system to the world and inspired a revival of Hawaiian knowledge and culture. For decades, he has dedicated himself to teaching the skills and values of wayfinding to generations of navigators throughout the Pacific Islands. Nainoa has sailed the Hōkūleʻa over 145,000 nautical miles throughout the Pacific and is currently on a journey around the world to grow the traditional knowledge movement and ensure a more sustainable future for Earth’s oceans.